Dealing With The Real Problem In Social Business Adoption – The People! Poorly defined incentives. In the rush to convince everyone to work with each other, most organizations fail to design meaningful incentives for adoption. The reality – most folks collaborate only when they need to. not when they are told to. Increase in actual effort. For many in the workforce, collaboration often means more work not less work. Connectedness results in more interactions, some less meaningful than others. Increase in effort often shifts the status quo resulting in internal resistance. Lack of choice in user experience. Time and time, people want to use the tool they are most comfortable with. . For example, activity streams make sense for some folks who are used to high frequency, always on, information flows. However, those accustomed to using email as a task list and structured approach to filing information will find discomfort with activity streams. Indifference to change. Inertia to do nothing often outweighs the calls for change. The workforce often prefers to do things the way they always have been. The workforce has seen many changes and at this point face change fatigue. Failure to communicate the urgency. Business model shifts not easy to communicate to the workforce. Veteran employees often develop coping mechanisms that define the new change as a reincarnation of the old change without understanding the nuance or urgency. Adopt gamification strategies. Listen for both the monetary and non-monetary incentives. Design a hierarchy and weighting of incentives to effort. Use gamification techniques to improve adoption and internal engagement. Apply design thinking to transform. Use design thinking scenarios to ideate future state processes. Remove friction points and redundant processes so that interaction is natural. Stamp areas where extra effort emerges. Deliver options based on use case. Identify cohorts and preferences in communication and cultural styles. Apply the 9Cs of engagement to deliver the right user experience strategy. Provide multiple interface choices as well as educate on new user experience metaphors. Align to self –interest. Show the workforce where and how the benefits apply to the individual. Highlight the overall group advantages. Providing the connection between individual and group benefits often plays a powerful lever in effecting change. Define the business model shift. For quant jocks, apply a financial business model. For poets, highlight the narrative in the shift and communicate the overall transformation at hand. While technology plays a key role in improving social business, core change management principles still must be applied to ensure organizational transformation. Technology alone will not solve the issue. 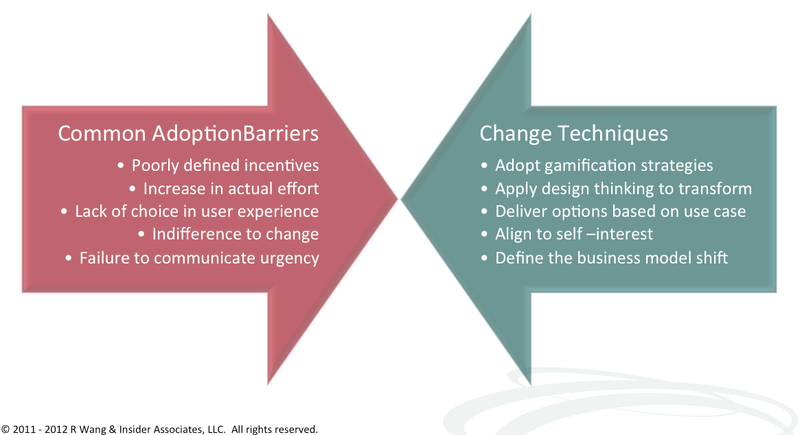 A combination of design thinking techniques applied to change management will ensure more successful adoption rates. Planning for change management will require as much time as the technical implementation. Consequently, successful social business efforts incorporate both technology and change management work streams in concert with each other. Yep- you are right- that’s why gamification is so important… but most people don’t get it… its also true for customer adoption… have the solution though… show it to you soon!